........One Warm Hug at a Time! We now have a facebook page, like us to stay up to date on what is happening with Hotpak Huggies. HotPak Huggies are microwaveable heating pads or hot packs and cold packs or ice packs that are in the shape of animals, birds, reptiles and bugs. They are made at our factory in Sharpsburg, PA. They are filled with a non-toxic, water-based gel that can be used hot or cold. Pop them in the microwave. The large ones stay warm for over 6 hours, all night long under covers and the small ones stay warm for over 3 hours, over 6 hours under covers or inside a jacket. Use them for aches and pains, shoulder pain, back pain, neck pain, cramps. Use them as a warmer on cold days and nights. I always say that they are good for body aches and pains but they are really good for the heart and soul. Who can resist a warm hug! The small Huggies are perfect for children, babies, infants, toddlers. Use them to establish a night time ritual at bedtime. Use them in the stroller or carseat to keep them warm. They are especially good for colicky babies. Heat them up slightly and place it on their tummy or back. Use them as a Boo Boo Pack for older children by placing them in the freezer. Lots of medical professionals use HotPak Huggies for therapy with alzheimer patients, autistic children and many other medical conditions. They are very therapeutic because of the length of time it stays hot and because of the weight. The large ones weigh 3 1/2 to 5 pounds and the small ones, 1 1/2 to 2 pounds. Nothing makes you feel better in life than a good warm hug. HotPak Huggies are completely unscented so they are great if you have allergies. Use them as a cold pack on those hot, sticky summer days. Put them in a plastic bag and place them in the freezer over night and use them to cool down. They don't freeze solid, they freeze a mooshy ice so they are still huggable. The gel packs cannot be removed from the animals, but each animal is microwave and freezer safe and can be fully hand washed and air dried. Spot clean them with a damp cloth or spray a stain remover on a cloth and clean them. 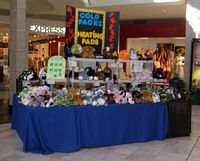 Belinda, the owner of HotPak Huggies says, "I have to say that I am in love with stuffed animals, they are so cute, and the thought came to me that I can make them useful and functional. 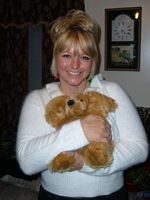 There is nothing like hugging a super soft, cuddly stuffed animal, except maybe cuddling a baby or a live puppy or kitty. The comfort and warmth you feel from hugging a HotPak Huggy stays with you." "If you have aches and pain, the heat helps take it away or at least helps you to better deal with it. If you are sad it brings you comfort, like an old friend. If you are cold, it will warm you. You can also put it in the freezer in a ziplock bag and use it as a cold pack. Once you try a HotPak Huggy, I guarantee you will love it." We provide top-notch cuddly, huggable, microwave heating pads and cold packs in the shapes of animals, birds, reptiles and bugs. Occassionally we will offer a limited edition HotPak Huggy. You have to hurry and order this because they don't last long. We do Craft shows and festivals. Please click here to see our schedule of events. As of today there are over 220 different animals ranging from bears to frogs to turtles to horses to bees to cats and dogs. We have our barnyard animal line with cows, horses, and pigs. Our woodland animal line with hedgehogs, groundhogs, bison (buffalo) and raccoons. We have parrots and penguins and owls. New animal shapes are being added constantly. Please see our catalog pages, Hotpak Huggies and small Huggies , to see all the animals that are available. And while you're at it, check out our EZ Heating Pads. If you just can't see hugging an animal, these might be just what you are looking for. EZ Heating Pads are made with the same non-toxic gel packs I make the Hotpak Huggies with. There are over 20 different patterns available. These are perfect for around your neck or to take care of any back pain or other pains you might have. See the EZ Heating Pad pages for more info.